Uppsala, Sweden—May 26, 2015—IAR Systems is proud to announce that its complete C/C++ development toolchain IAR Embedded Workbench now supports more than 10,000 devices, from all major microprocessor vendors. This unparalleled wide support puts IAR Embedded Workbench in a class of its own, enabling users to work with the same user-friendly development tools for virtually any device on the market. 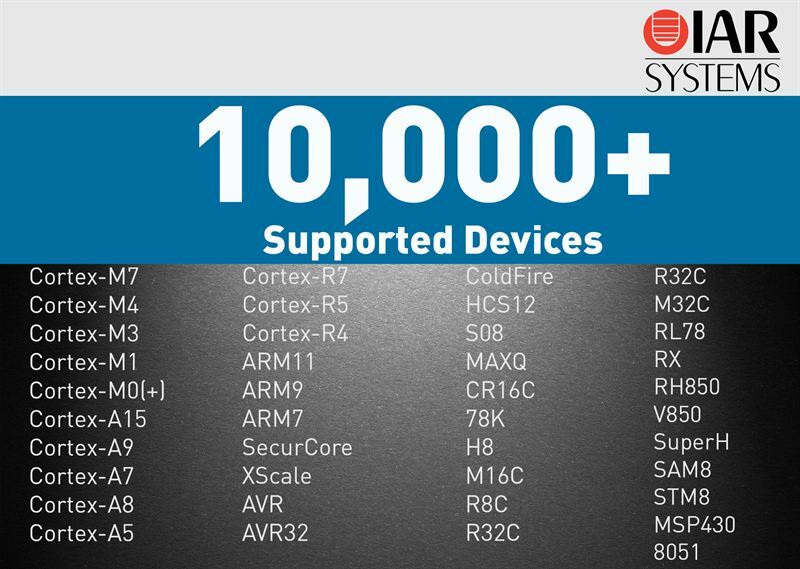 In order to provide support for the largest number of 8-, 16- and 32-bit devices, IAR Systems has established strategic partnerships with leading microprocessor vendors such as Renesas, Atmel, STMicroelectronics, Freescale and Texas Instruments. The strong relationships and longstanding knowledge sharing with partners enables IAR Systems to deliver the market’s most comprehensive processor support by a wide margin. This has made it possible for some of the world’s largest corporations and thousands of small and mid-sized companies to standardize their development on IAR Systems’ software, gaining unique flexibility and freedom from having to consider the choice of software in their selection of microprocessor. The fact that IAR Systems’ customers are able to maintain their development environment when changing processor platform and reuse most of their code saves them both time and money. IAR Embedded Workbench is a powerful development toolchain that incorporates a compiler, an assembler, a linker and a debugger into one completely integrated development environment. Find all supported devices at www.iar.com/device-search.